Whenever I make this Raw vegan vegetable Salad, I feel like eating healthy. Healthy eating is always easy. A salad is always a one-pot dish. The wonderful and easy things about salad is they can be made in any combinations. They are a bowl packed with healthy nutrients. Our bowl food- raw vegan vegetable salad- can be your next breakfast, lunch, dinner, snack, side or anything as you like it. The ingredients i used to make this healthy salad are the must-haves of every kitchen. So you can directly prepare it. No messy cooking or confusions about the ingredient measurements is the simplicity of salads. I love preparing these vegan salads. Raw food is not all about bean sprouts, chia seeds and hemp seeds. 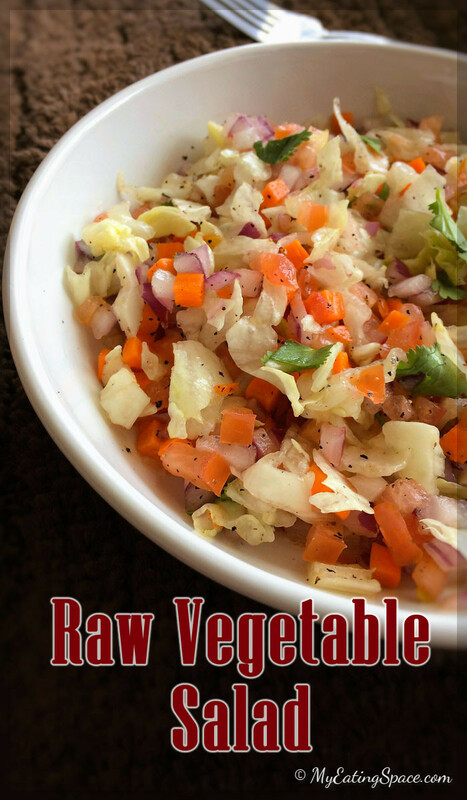 It can be as easy as this raw vegan vegetable salad. Anyone can make it. This can be a wonderful peppery dish for the coming thanksgiving. They are gluten-free also. This easy and fresh salad is one of the best options to include raw food into your diet. By adding this raw vegan vegetable salad to your daily diet, you are cutting down a small portion of cholesterol from your body, everyday. 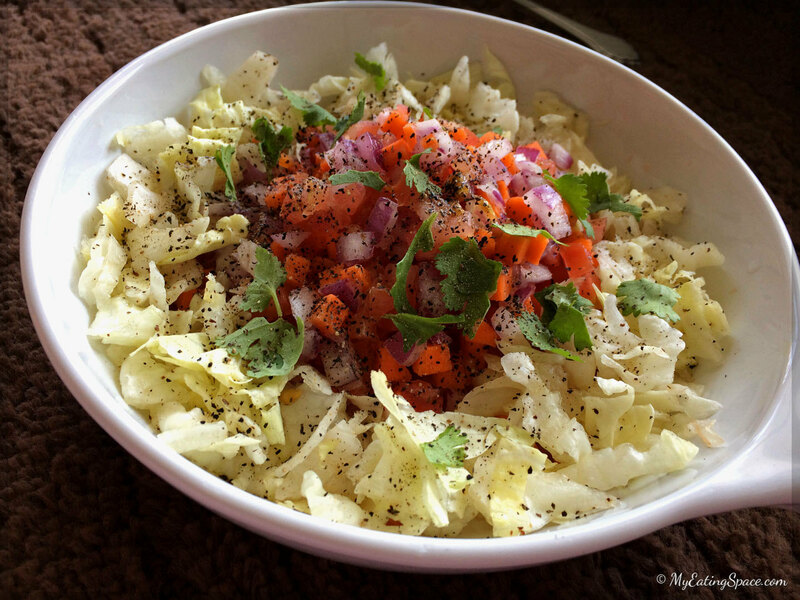 The peppery salad will add a colorful, healthy freshness to your dining table, I promise. This vegan salad makes a healthy bowl food for you and your family for sure. All veggies are used raw and it's just about bringing everything together. They are gluten-free and including this healthy raw food helps to reduce a small amount of fat from your body, daily. 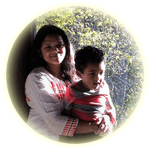 Wash all the vegetables, tomato and cilantro leaves in cold running water. Finely chop the lettuce, carrot, tomato and onion. Add cilantro leaves, ground black pepper, apple cider vinegar and salt. Fluff to mix together with a fork. 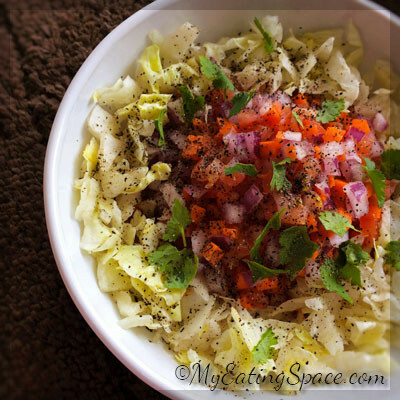 Enjoy a crunchy and peppery raw vegan vegetable salad. Add pepper to adjust to your spice level. You can avoid vinegar if you don't want your salad to be more acidic. You can add any vegetable you like to prepare a crunchy salad. Do you know lettuce can reduce the cholesterol, induce sleep, protects the brain cells, contains lots of dietary fiber and helps to controls anxiety? Tomatoes are good source of vitamin C and contains lycopene which is considered to have the highest antioxidant property. Add more of these to your daily diet for a healthy living.